The following is a roundup of news on North Dakota University System’s 11 public colleges and universities for the week ending Friday, Dec. 18. The North Dakota Interactive Video Network started out with four sites and a few classes back in 1989. It didn’t take long before IVN grew to become an essential campus tool for the delivery of courses and degree programs to students geographically displaced from the host institution. And while other delivery tools and technologies have come and gone during these past 26 years, IVN continues to be one of the most popular and dependable academic technologies within the North Dakota University System. The Fall 2015 semester recorded the highest student enrollment on record while the total number of courses were slightly down from last fall’s record numbers. Nearly 3,000 students enrolled in IVN courses this fall, which is about 250 more students than the Fall 2014 term. However, the total number of courses delivered dropped slightly, from 228 last year to 212 this year. Overall, more than 100 instructors taught dual credit, undergraduate and graduate courses. Jerry Rostad, Assistant CIO for Core Technology Services of the NDUS, points to a couple reasons why IVN’s staying power continues to be strong. For high school students looking to get a start on college courses, they could look to the five community colleges, Dickinson State University and Mayville State University for 100 and 200-level courses in topics ranging from English to Psychology. During fall 2015 semester, 592 students took those opportunities that allowed them to take advantage of classes offered elsewhere in the state without having to drive there. At the undergraduate level, most NDUS colleges and universities offered some form of IVN courses, with DSU offering 34. Departments offering IVN classes included Business, Computer Technology/Computer Information Systems, Education/Elementary Education, Health Professions, Human Resources, Natural Resources, Math/Science, Social Sciences, Humanities, Nursing, Engineering, Criminal Justice and Social Work. 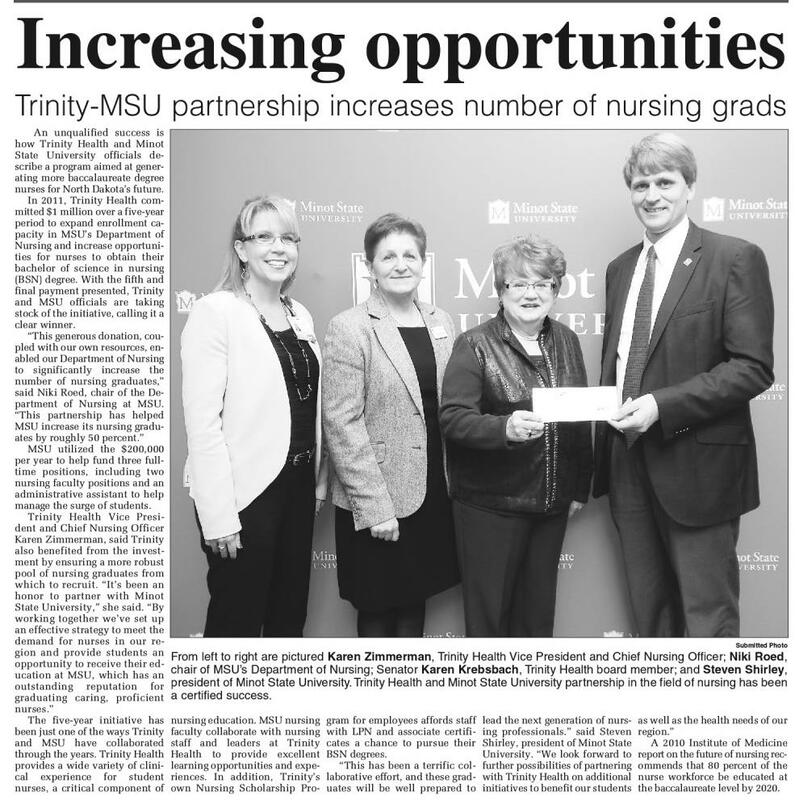 Consortiums like the Dakota Nursing Program rely on collaborative efforts through the participating colleges. Bismarck State College, Dakota College at Bottineau, Lake Region State College and Williston State College utilize IVN for their offerings of the Practical Nursing and Associate Degree Nursing programs there. In total, 609 students were able to take courses offered under those programs, not only at the participating schools but in other NDUS institutions and one tribal college. For graduate students, 29 courses were also offered for masters and doctoral levels, which 427 students took advantage of this past semester alone. Chancellor Mark Hagerott said that the increase in IVN usage showed one clear path forward on how campuses could share services in the form of interactive class time. Hess Corporation donated $30,000 to BSC to buy training equipment for the Mechanical Maintenance Technology and Instrumentation & Control programs. This donation brings the total financial support from Hess to $60,000 over the past two years. Representatives from Hess also serve on various advisory boards for BSC. Nursing students in the Registered Nurse program at BSC received a 100 percent pass rate for those who took the National Council Licensure Examination (NCLEX-RN) administered by the National Council of State Boards of Nursing. BSC Mass Communications students received several awards from the College Media Association/Associated Collegiate Press. Mystic Media earned a Pinnacle award as Two-Year TV Station of the Year. Both the student newspaper, The Mystician, and a MystiCast episode won David L. Adams Apple Awards. The Fall 2015 DCB Honors Symposium was held this week. This event was started a number of years ago to focus and strengthen the educational experience students receive at DCB. The Honors Program is a component of the college’s focus that aspires students to go beyond normal expectations. This year’s program consisted of a variety of learning opportunities aimed at preparing students for a lifetime achievement. Presentations ranged from the caffeine experiences to soil moisture monitoring within the chemistry department. Psychology, Chemistry, Anatomy and Psysiology honor students presented. The DCB Lumberjacks will host the Norther Plans Shootout December 12th. This is for 5th and 6th grade boys and girls. The tournament will be played in three courts located between BHS and DCB. All participants receive a free t-shirt and admission to a Jacks home BB game. There will be photo opportunities for the 5th & 6th grade players with their favorite Jack. All proceeds to go to the DCB Ladyjacks, Lumberjacks and BHS basketball teams. The LumberActs hosted a winter performance of Twelve Angry Jurors this month. There were fourteen LumberAct members involved. They presented their performance “in the round” at the Alumni Center in Thatcher Hall at DCB. Carolers around Dakota College at Bottineau spread tidings of joy and good cheer​ during the first week of December. Faculty and students sang Christmas songs around campus as part of the annual tradition. ​DSU was ranked third in online education and first in affordability in North Dakota by OnlineColleges.net. OnlineColleges.net considers accreditation, quality of education, student experience, and range of programs in its study of the best options for online education in North Dakota. Rebecca Dressler, a junior nursing student at Dickinson State University (DSU), was named Student Nurse of the Year (SNOY) at the annual competition Thursday, Nov. 19. Dressler, from Halliday, received a degree in practical nursing from North Dakota State College of Science in Wahpeton. She has been an LPN for five years and is continuing her education at DSU. She expects to graduate in the fall of 2017 with a degree in registered nursing and minors in psychology and biology. DSU was ranked third lowest in student loan default rates of institutes in North Dakota by the U.S. Department of Education for the 2012 fiscal year. At 6.1 percent, DSU is far below the national average of 11.8 percent. Only NDSU and the UND had lower rates in the state. To determine a school’s rate of student loan default for 2012, the Department of Education reviewed the number of students who began to repay their debt between Oct. 1, 2011, and Sept. 30, 2012, but defaulted before October 2014. ​​Lake Region State College student Carrie Nienhuis was recently awarded the NASA Space Fellowship recognizing her work in the field of science. The fellowship includes an award of $1,000 for completing 100 hours of work and assistance in the lab in the science department. Nienhuis also received a $1,500 NASA Space Scholarship in 2014 which helped to pay for tuition and an online science course. A sophomore at Lake Region State College, Nienhuis discovered her interest in science while attending a chemistry class in high school. She started at Lake Region State College in 2014 wanting to pursue a career as a science teacher, but after taking several courses, she changed her focus, “having the opportunity to experience so many different science classes opened my eyes to other career options,” says Nienhuis. Dr. Anton Treuer, professor of Ojibwe at Bemidji (Minn.) State University and the author of 14 books, was at MaSU Nov. 9 and 10 to share information on Native American culture. Treuer talked with MaSU students, faculty, and staff, as well as area elementary and high school teachers, during his visit. Sarah K. Anderson, Ph.D., assistant professor of education at MaSU, was a presenter at the 40th annual conference of the American Studies Association of Norway (ASANOR) Oct. 23 in Stavanger, Norway. Her presentation and paper accepted for publication provided a look at how educators transform learning experiences and create personal learning networks. A highlight of MaSU homecoming 2015 festivities was the dedication of the Military Honor Garden at the Edson and Margaret Larson Alumni and Leadership Center. The program was headlined by remarks from Military Honor Garden project co-chairs and MaSU graduates Lt. Gen. Emil “Buck” Bedard, USMC (Ret. ), and Dr. Martin Johnson. 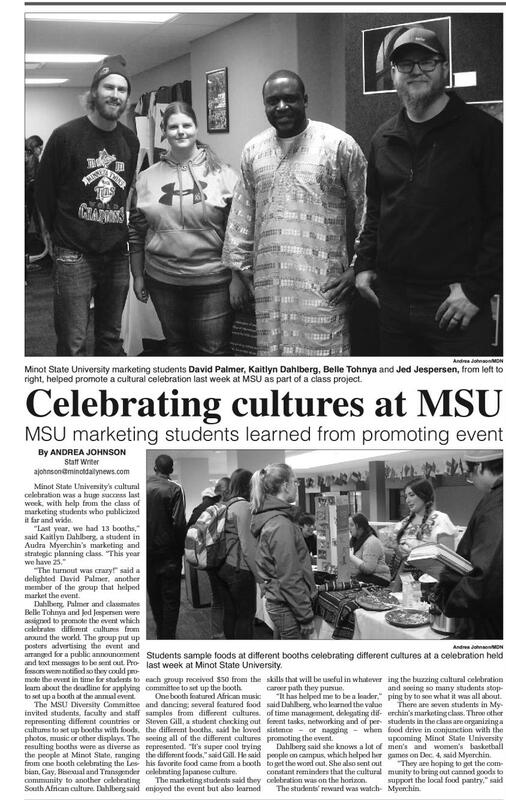 The Student Social Work Organization sponsored “Freezin’ for a Reason” Nov.14. This marked the 13th annual Freezin’ for a Reason event in Minot, where participants stood in the cold and “froze” to experience homelessness firsthand. SSWO holds the event to raise awareness of area homelessness and to collect non-perishable and monetary donations. Beneficiaries were the Minot Area Homeless Coalition and Community Action Partnership. Area high school students competed Dec. 3 in the Department of Business Information Technology’s 18th annual Technology Day. Students competed in accounting, business law, desktop publishing, document production, business principles, spreadsheet applications and presentation software. Participating high schools were Berthold, Bowbells, Burke Central, Des Lacs-Burlington, Kenmare, Powers Lake, Sawyer, Stanley, TGU Granville, TGU Towner, Underwood and Westhope. Underwood was the overall winner for the eighth year. NDSCS recent graduate Austin Olin came in first at the National SkillsUSA Competition last June and won a Harley Davidson motorcycle for the College, which will be used for student training. Olin, who majored in Powersports Technology, graduated from NDSCS in May 2015. Ten NDSCS Agriculture students recently attended the North Dakota State Postsecondary Agricultural Student (PAS) conference in Fargo, N.D. where the following students placed: Adam Sipp, Ashlyn Draovitch, Gabby Nordick, Colton Johnson and three NDSCS Teams. The NDSCS Alumni Foundation recently announced that 20 major gifts have been received since July 1, 2015. These 20 gifts, or pledges, total $1,198,077. An additional $599,038 has been matched through the ND Challenge Grant, resulting in a grand total of $1,797,115. Approximately $1 million will go directly into Scholarship Endowments while the other gifts have been directed towards annual scholarships, specific programs or athletics. NDSU’s new, state-funded STEM Building will open for classes in January. It is a student-focused structure made up entirely of classrooms, labs and study areas. It is designed for flexibility, interdisciplinary collaboration and teaching innovation. A building dedication was held Dec. 10. NDSU’s new Center for Immunization Research and Education addresses concerning trends in vaccine coverage through education and research and finds ways to improve vaccine acceptance and immunization rates in both children and adults. The center educates the general public, health providers and public health workers on all aspects of immunization. The University of North Dakota’s College of Engineering & Mines Institute for Energy Studies has been selected as one of 10 nationwide projects to receive federal support to bolster the university’s cutting edge coal energy development research. Working in tandem with UND’s Energy and Environmental Research Center (EERC) and with the Barr Engineering and Pacific Northwest National Laboratory, UND’s College of Engineering & Mines Institute for Energy Studies will receive nearly $750,000 in federal funding to boost the school’s efforts to recover rare earth elements from coal that are essential – and in high demand – across electronic, computer, transportation, health care, and national defense industries nationwide. The release of University of North Dakota English Professor Elizabeth Harris’ translation of Antonio Tabucchi’s bestselling novel, Tristano Dies, from Italian, was celebrated recently in New York City. Harris also visited translation students at Columbia University and Barnard College. Tabucchi is considered the most important writers of postwar Italy. University of North Dakota student Benjamin Olson was named a University Innovation Fellow by the National Center for Engineering Pathways to Innovation. He is the first Innovation Fellow from UND. The NSF-funded program is directed by Stanford University and VentureWell, and promotes engineering and entrepreneurship on college campuses. University of North Dakota’s Introduction to University Life students recently built a “mountain of giving,” comprising weeks’ worth of nonperishable food collections around campus. Students encouraged the campus community to donate to the local Northlands Rescue Mission’s Kids+ Backpack Distribution Program, which distributes about 600 bags of food each week. The University of North Dakota Quo Vadis Chapter of Mortar Board, a national senior honor society, played host to its 36th annual Turkey Basket Drive, distributing food baskets to the nearly 1,300 families from the Grand Forks area. Nearly 5,000 people were fed on Thanksgiving thanks to the turkey baskets. Fourteen members of the Valley City State University community, including student, faculty and staff, took the Special Olympics Polar Plunge on Sunday, Nov. 15, at the Jamestown (N.D.) Reservoir. The VCSU contingent raised more than $3,000 for Special Olympics North Dakota. Richard Stenberg, Associate Professor of History & Political Science at Williston State College co-authored an article with retired Fort Union Park Ranger Randy Kane that appeared in the Fall 2015 edition of Museum of the Fur Trade Quarterly. For the past twenty-one years, Stenberg has been an active park ranger at Fort Union over the summer months. Stenberg researches and prepares scripts for volunteers to reenact The Last Bell Tour, an annual Living History event conducted by Fort Union. The article, “The Boldest Man that was ever on the Missouri: A Reassessment of Alexander Harvey and his Role in the Upper Missouri Fur Trade” was inspired by a reenactment. Williston State College’s (WSC) Math and Science department received a generous donation of chemistry glassware worth just over $6,000 from NDSU Williston Research Extension Center (WREC) November 5. WREC Plant Pathologist Dr. Audrey Kalil contacted Derek VanderMolen, WSC Associate Professor of Chemistry, as the center was looking to clear out excess glassware. The collaboration between Williston Economic Development STAR Fund and TrainND-Northwest to complete the new TrainND training facility located at 415 22nd Ave NE was recognized twice in October with local and national awards. Internationally, Williston Economic Development received the Excellence in Economic Development Award from the International Economic Development Council (IEDC) during their annual conference in Anchorage, Alaska, October 4-7. Locally, Economic Development Association of North Dakota awarded the Williston STAR Fund and TrainND-Northwest for Project of the Year, October 25 in Watford City. Piesik nominated the collaboration between the STAR Fund and TrainND for this award. The following is a roundup of news on North Dakota University System’s 11 public colleges and universities for the week ending Friday, Dec. 11. State Board of Higher Education Chair Kathleen Neset talks about confidence in the system coming into the New Year. When milestones arrive they can usually be considered a good time to reflect on how previous accomplishments and challenges led to them. As our students closed out another semester and we’re closing in on the end to another year, I find that it’s a good time to do just that. In the past year there have been numerous topics that the State Board of Higher Education and the North Dakota University System have addressed, and there are more on the way. These topics have been brought to our attention from campus representatives, from legislators and from community members, and all have one singular goal in mind: to help continue shaping us into the best university system that we can be. The work will continue. Already, work is underway in standardizing processes throughout the university system through about two dozen projects. Campus leadership is adding to that forward progress and the presidents have identified nearly 100 goals that all are working toward to create more efficiencies of process, maximize shared services, limit redundancies, refine governance models, contain costs, increase retention, and more. As they move forward, each process toward standardization and each objective met will strengthen both the system and its 11 individual colleges and universities. That will help solidify the foundations for education that are being used by staff and faculty to create and shape the high-quality academic programs our students deserve. Recently, the Board moved forward with some other actions that I think will be of benefit to the state and the university system next year and beyond. One of those items concerned a new offering that deals with teaching credentials. We’re hopeful that the new Master of Arts in Teaching offered at Dickinson State University, Mayville State University and Valley City State University will help offer another path forward to those education-minded individuals who would like to earn teaching credentials. We’re confident that it will be one step to help address the current teacher shortage facing the state. The Board also appointed former N.D. Governor and former Secretary of Agriculture Ed Schafer as the interim president for the University of North Dakota. We’re confident in Schafer’s capability to lead and manage this world-class research university, and are hopeful in the things his interim service will bring to the campus. Despite some criticisms that may exist, I feel that there is a common undercurrent of positivity that links all these topics, and that speaks to the confidence. That’s not just the confidence I have in the Board, but the confidence I have in the administration, staff and faculty to continue providing the highest-quality environment for our students. And I believe it’s reflective of the confidence that our students themselves have in the path they’ve picked for themselves, right here and now throughout our great system. I believe that each person is always learning. It’s with confidence that I say the Board has heard you and is taking those perspectives as lessons to apply now and in 2016 to help bring success to all those involved in the university system. Our mission here with the system and the Board is student success. If we accomplish that by fostering the different colleges and universities, and their faculty and staff, then we meet the mission. Our foremost aim is the success of our students. State Board of Higher Education Chair Kathleen Neset led the meeting yesterday that focused on goals into the New Year. Photo by Justin Eiler, North Dakota State University. Members of the State Board of Higher Education wasted no time this week getting into the details of how and why certain goals should be pursued in the coming year. At its regular meeting held this month in Fargo, the Board touched on multiple topics but spent considerable time discussing how it and the North Dakota University System would pave the way forward for higher education in 2017. Board Chair Kathleen Neset opened the meeting by expressing her concern over student and campus safety in light of recent national headlines. She noted that it would be vital going forward to ensure that there were plans in place for safety and communication. Chancellor Mark Hagerott gave an update from the university system, first introducing Craig Hashbarger, the NDUS performance auditor at the state auditor’s office. Other updates included a meeting with stakeholders, the presidential search at University of North Dakota that had moved forward the day before, and an update on the NDUS Foundation on which he deferred to Board Member Dr. Kevin Melicher for the details. “Almost every one of the presidential goals involve building the foundations,” Melicher said in reference to the NDUS Foundation, which was receiving renewed interest. “In no way whatsoever do we want this foundation to supplant what those foundations are doing. However we have an opportunity to expand some of the initiatives throughout N.D. such as Bakken U, Cybersecurity, retention and graduation rates, etc. If we can build this foundation up we’ll have the potential to move some of these efforts forward. Next, Hagerott spoke about the NDUS technology initiatives on Cybersecurity, Unmanned Aircraft Systems and High Performance Computing. He noted that nearly every campus was doing something with computers and security, and he was looking forward to that expanding in the future. He said the initiative was just getting underway within the system, which could be poised to lead nationally on the subject. He added that the state’s work with UAS and High Performance Computing comprised two legs on a three-legged stool, with Cybersecurity rounding out that effort. Hagerott then spoke about the recent visit by the Higher Learning Commission, who spoke to NDUS employees and leadership, as well as lawmakers and business leaders in mid-November. He said that HLC representatives noted there were positive changes put in place since the last visit and NDUS looked forward to seeing the final report. In budget matters, Hagerott said that all campuses would have a proactive part in providing representatives to a working group on that subject in the near future. The working group was set to look at the change in the state’s budget forecast in light of lower oil and agricultural revenues. Then the Chancellor moved on to discussing his and the presidents’ goals. He added that he sought Board member input. Board Vice Chair Don Morton noted that from a high level perspective it would be good to have individual metrics to track certain issues, adding that they would be important to understand which strategies were working and why. Board Member Greg Stemen said that he would find it valuable to review a simplified process so he and other Board members could help put all the metrics in perspective. Board Member Nick Hacker said that no matter what, goals needed to be measurable and benchmarked, referring to North Dakota State College of Science President John Richman’s goals as being well-done. Faculty Advisor Eric Murphy said he felt there were numerous goals that were metric-driven, such as student success. The Board then heard research overviews from UND’s Dr. Grant McGimpsey and North Dakota State University’s Dr. Kelly Rusch. McGimpsey spoke on the commercialization of strategies, working with N.D. companies and encouraging an entrepreneurial atmosphere at UND. He added that they wanted to be “business friendly at UND.” McGimpsey touched on human health, aerospace, energy, cybersecurity, high performance computing and data studies. Rusch offered similar comments from NDSU, speaking about how NDUS held long-standing partnerships with other colleges, EPSCOR, “knowledge transfers” that begin at the research labs and make their way to the state, nation and world, and research and scholarly activities. Some of those topics included big data, Unmanned Aerial Vehicles and their use in Precision Agriculture, tackling wheat rust pathogens, new drug delivery systems for pancreatic cancer, and electric materials/nanotechnology. Rusch stated that NDSU’s Class 100 Clean Room was one-of-a-kind in this part of the Midwest, and ensured certain processes could move forward to industry and scientific standards. These programs were part of national research networks and had been integrated to ensure student success. Rusch also spoke about private sector partnerships, noting that there were currently 65 active partners. She added that they were actively seeking new partners to grow funding and expand research enterprise. Stemen posed questions on the Center for Nanoscale Engineering, which served to open extensive discussion on the topic. Morton, Murphy and Hacker inquired through the discussion on responsibility and assets. Rusch explained the nature of the background of CNSE, which she said had initially been funded through earmarks that no longer existed. She added that most of the physical assets, intellectual property, personnel and expertise originally assigned to the center was still a part of NDSU. She concluded that it had not been formally closed. Sen. Tim Flakoll spoke to the Board, stating that he appreciated the opportunities being given for input from legislators. He added that in doing so, the Board fostered an era of new relations among its members, the university system, and the Legislature. He added that it was vital that these types of meetings be attended, and invited SBHE members to legislative hearings. Attending these meetings could provide more nuanced perspective than could sometimes be provided for in written reports. Flakoll provided the Board with an update to discussions he’d recently held with the outgoing and incoming U.S. Secretaries of Education, and national education legislation that could align with the state and system’s goals for scholarships, community colleges and more. “When I go to national meetings I still feel that we’re the most fortunate state in the country despite our challenges,” he said, noting that the legislature had done much to try and prepare for those challenges. He added that there was progress on N.D. Legislature’s Senate Concurrent Resolution 4003, which higher education in the state would be interested in as it dealt with foundation aid and aid to school districts. Neset presented UND President Robert Kelley with a plaque at the last SBHE meeting of the year in recognition of his years of service. The Board then voted to approve the Chancellor’s goals, which include an office reorganization, the implementation of strategies for excellence, affordability, accessibility, and system responsiveness. Following the vote, Hagerott spoke about the NDUS office plan, which requests that the $1 million previously set aside by the Legislature be released to help reach the system’s goals. The plan would help create a more unified system, aid it in operating in a more efficient manner, and help students graduate faster and with less debt. The Board then heard details on budget, finance, and facilities requests before calling for a vote, which found unanimous approval. Next on the agenda were items relating to the academic and student affairs committee, the audit committee, and board policy readings. Unanimous votes were held for all, including the first readings of policies regarding appointments, pay policy, tuition waivers/tuition assistance, early retirement, and test of high school equivalency. Second readings were held on policies regarding state grant, North Dakota Academic and Career and Technical Education scholarships, and admissions policies. The Board also formally thanked UND President Robert Kelley and his wife, Marcia, for their years of dedicated service. The next regular meeting is scheduled for Thursday, Feb. 3 at NDSU when the Board will meet jointly with the Interim Higher Ed committee of the N.D. Legislature. NDSU’s new STEM Classroom and Lab Building will open for classes in January 2016. Sen. Tim Flakoll, NDSU Pres. Dean Bresciani, Doosan Bobcat Pres./CEO Scott Park, Gov. Jack Dalrymple, Doosan and Bobcat Co. Pres. Rich Goldsbury, NDSU Student Body President Eric McDaniel, and NDSU Provost Beth Ingram participated in the ribbon cutting ceremony yesterday at NDSU’s STEM Building. Members of the State Board of Higher Education were also present at the ribbon-cutting ceremony. Six of 11 public colleges and universities in North Dakota were recently awarded Challenge Grants for projects at their respective campuses ranging from scholarships and endowments to expanded educational opportunities. Lake Region State College, Mayville State University, North Dakota State College of Science, North Dakota State University, University of North Dakota and Williston State College all received financial awards through the N.D. Higher Education Challenge Fund. The fund was created in 2013 by the state legislature and is overseen by a grant review committee. Chancellor Mark Hagerott said the Challenge Fund was a significant way for the system to partner with the state to help reach goals at each campus. As part of the most recent awards, the institutions received a total of $2,003,830.04 in grant funding out of more than $23.5 million set aside by the legislature for matching funds, where the State Board of Higher Education would award one dollar in matching grants for every two dollars of non-state, non-federal funding raised by the institutional foundations throughout the NDUS. Seven million dollars has been set aside each for NDSU and UND, with one million set aside for each of the other nine institutions in the NDUS. Lake Region State College: $98,858 to expand learning opportunities for students preparing to become American Sign Language interpreters. Mayville State University: $145,307.43 to go toward a scholarship endowment and a scholarship campaign. North Dakota State College of Science: $234,879 for two scholarship endowments and one departmental endowed chair. North Dakota State University: $866,814.21 to go toward thirteen scholarship endowments. University of North Dakota: $600,641.40 to go toward eight scholarship endowments. Williston State College: $57,330 to go toward a scholarship endowment and a scholarship program. The grants, which were awarded just before the Thanksgiving holiday, were the third announced this year. Twelve awards totaling $628,375.64 were made in September through Bismarck State College, NDSCS, NDSU and UND for scholarships and endowments. In July, twelve awards were made totaling $774,373.50 throughout Minot State University, NDSCS, NDSU and UND. The following is a roundup of news on North Dakota University System’s 11 public colleges and universities for the week ending Friday, Dec. 4. A content capture system is making information more available than ever throughout the North Dakota University System. Since its implementation throughout the NDUS, Tegrity has seen its usage and recording hours skyrocket. The system, called Tegrity, is giving students throughout the 11 colleges and universities in the NDUS access to lectures and other recorded content, taking them well beyond the traditional classroom walls. Patti Heisler, assistant director of Training and Academic Technologies, said Tegrity is a robust system that can be used in a wide variety of ways, ranging from traditional lecture recordings to student presentations, in both the traditional classroom and the online setting. The versatility of the application is one of the things that makes it appealing to users. Finding lectures is as easy as a few clicks. Students can log in on any Internet-connected device and from there they can search to find recent recordings. According to Heisler, other opportunities have arisen for utilizing the content capture beyond lecture-recording. Riggins, associate professor of Management Information Systems, said he and Heisler began using the content capture system to teach MIS 320 during the 2012-2013 year. The required, lecture-format course seated as many as 180 students per class. Due to the size of those classes, Riggins and Heisler had to come up with a plan that allowed for the students to do group presentations that didn’t take away from lecture time. They found Tegrity. Riggins added that students had been receptive to that format, as it gave them the opportunity to utilize a new technology to meet all the needs of their coursework. After a brief, in-class orientation to the background and use of the software the students are provided a download and offered some class time to make their first videos. From there, most video work is done outside of the classroom, which allows for further education on the processes and scheduling of teamwork. Tegrity offers numerous opportunities for education to aid both faculty and students. or online students in the summer course, coordination comes a bit easier as it’s done nearly through the web. Each team member is responsible for a certain number of slides, which are required to be named a particular way. Tegrity’s alphanumeric listing allows them to be reviewed, in order, making it easy for professors like Riggins to review and grade. As part of the summer course offering, Tegrity offers another opportunity – the ability to break up the 50-minute lectures into smaller modules. Doing so allows students to go to one module, then follow along with the slides and read the associated text. Riggins said that having multiple modules like that can ease the strain students would otherwise feel in having to watch an hour-long lecture on their computer or smartphone screen. “For the most part I think students like the ability to go back and watch certain parts multiple times,” he added, noting that for online courses students could reference the modules during their conversations in the discussion boards to make up for the lack of in-person classroom interaction. Recordings can be synchronous or asynchronous and last anywhere from 10 minutes to a few hours. Over time, as students and faculty have grown more accustomed to the software’s uses, there has been a sharp increase in usage. The company’s claims of keeping student learning as the primary focus is readily available in its accessibility, and increased usage since full implementation throughout NDUS in 2012. But lecture capture isn’t its only focus. According to the software documentation, students are able to “search content, collaborate with instructors and classmates, take notes, set bookmarks and more.” Heisler added that the lecture capture software also allowed for the sharing of resources among campuses.